Right technique leads to strong skills, which leads to strong performance. Ensure that your budding typist is acquiring the skills necessary for success in our computer age through this quiz and test book. The quizzes and tests covering one year of keyboarding are correlated with the text Keyboarding and Document Processing, 2nd ed. (which is also used for a semester course on document processing), and Keyboarding and Document Processing Teacher Guide/Solution Key, which includes daily plans for all three semesters of keyboarding and document processing. 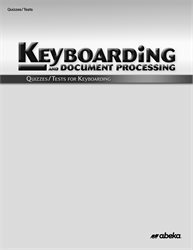 Be sure to also get Keyboarding and Document Processing Quiz/Test Key for Keyboarding since along with answers it provides grading specifics for measuring each essential skill at its proper time. Grades 10–12. These 15 quizzes over specified textbook pages provide important review and reinforcement and help you evaluate learning. You will know when your teen needs extra reinforcement in an area before progressing to the next section or unit test. A variety of objective question formats on the quizzes holds your teen’s interest and verifies whether he understands a concept, no matter how it is presented. The 8 tests are keyed to coincide with the 8 keyboarding chapter divisions, giving you the flexibility to adjust testing to your schedule. Tests 1–4 cover first semester. Tests 5–8 cover second semester. Tests 4 and 8 are cumulative examinations, reinforcing the skills taught. In addition to objective-format sections, tests also include sections that require explanation or editing using proofreader’s marks. These sections test higher levels of learning and the ability to apply the concepts to practical work situations. Except for the final exam, each test includes a production section in which your teen will practice typing and is tested on specific aspects such as his form, ability to apply proofreader’s marks, formatting, or accuracy. Your teen will learn to pay attention to detail as he is required to follow directions carefully.